Currency markets continue to focus on the gaps in monetary policy that have opened up across the major economic areas. We see the Federal Reserve on track to increase interest rates twice in 2016, following their rate hike in December, with the Bank of England also hiking in the final quarter of 2016. By contrast, most other G10 central banks, in particular the ECB, remain overwhelmingly in easing mode. The combination of expected monetary tightening by the Federal Reserve, and the closely related sharp falls in commodity prices, caused sell-offs in most emerging market currencies in January and February, particularly those from commodity exporting countries. However, the recent stabilisation of commodity prices has fuelled a partial rebound. After many years of being pegged against the US Dollar, the People’s Bank of China (PBoC) recently moved to a basket of currencies whose weights are set in rough relationship to their weight in Chinese trade. In addition to keeping track of this basket over the medium-term, the PBoC intervenes to prevent sharp daily moves (over 2%) against the US Dollar. Since the the devaluation of the Yuan in August last year, when the fixing rate was moved around 3% lower against the USD in just one week, the currency has suffered a sharp depreciation against the US Dollar. 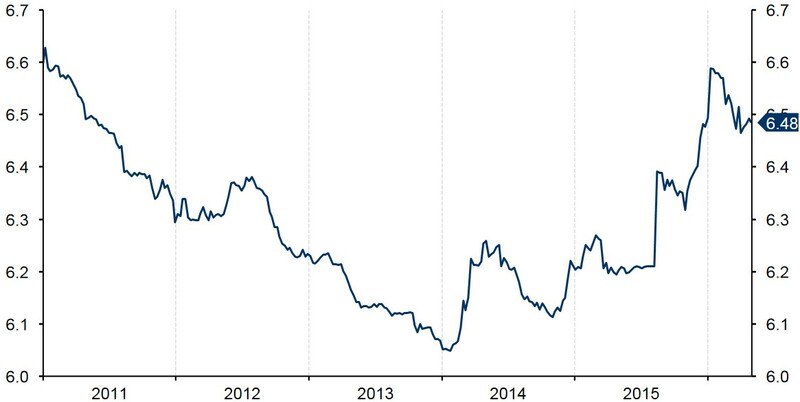 The Yuan fell to its weakest position in five years at the beginning of 2016, although has since recovered in line with a weak Dollar and stabilisation in Chinese financial markets (Figure 1). The recent CNY devaluation has come amid a notable economic slowdown in China. Economic growth fell to its lowest level in twenty-five years in 2015 (Figure 2), with the country overtaken by India as the fastest growing major economy in the world. The economy grew by just 6.7% in the first quarter of 2016 and is now expected to register growth of around 6.5% this year and just 6.2% in 2017, well below the central bank’s seven percent target. Industrial production and retail sales growth have both slowed, while the Yuan’s relative strength against the currencies of China’s major trading partners has caused exports to plunge. Exports fell by over 25% in the year to February, its largest decline in almost seven years. In a bid to stimulate the stuttering Chinese economy, the central bank has been forced to conduct a series of interest rate cuts. The benchmark interest rate was lowered by 25 basis points to 4.35% in October, with a further slowdown this year likely to ramp up pressure on the People’s Bank of China to increase stimulus further. Foreign exchange reserves in China have also continued to decline, with Chinese authorities selling US Dollars to support the Yuan and stem capital outflows. 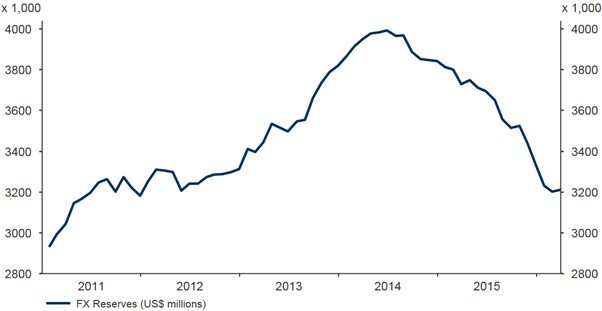 FX reserves have fallen by nearly a quarter in the past eighteen months to a near five year low (Figure 3). The Yuan has, however, received some support from a stabilisation of Chinese financial markets following the sharp sell-off in stock markets witnessed throughout the second half of 2015. We believe that there has been an excessive focus in China on the recent stock market decline and do not expect this to cause any further significant devaluation for the Chinese Yuan, given only 20% of Chinese wealth is held in shares. After dropping sharply, FX reserves have also stabilised, reflecting valuation effects from Dollar weakness and a slowing on capital outflows as Chinese authorities tighten controls. 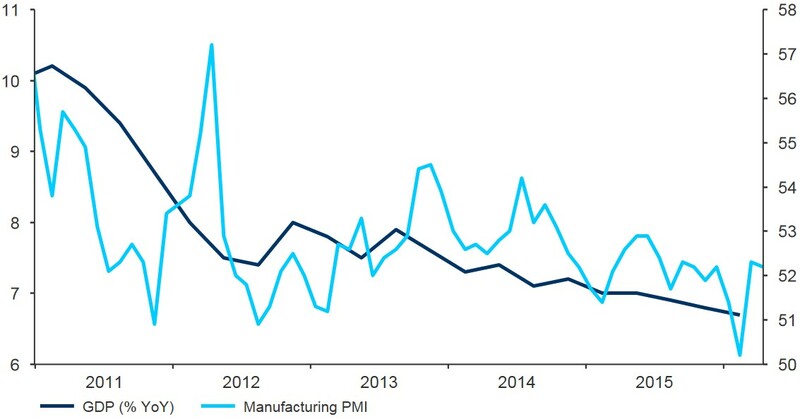 In addition, economic data has tended to surprise on the upside, including strong numbers in the leading PMI business sentiment indicator and above-estimate first quarter GDP growth. One of China’s key long term goals is the internationalisation of the Yuan as a means of exchange and store of value. Any further sharp devaluation would shake confidence in the Chinese currency and be ultimately self-defeating. Further, a weaker CNY would run counter to the goal of rebalancing the Chinese economy, away from investment and towards domestic consumption. We therefore continue to believe that Chinese authorities will stand by their implicit goal of keeping the Yuan stable against its trade-weighted basket of currencies. What does the future hold for CNY? With the divergence in monetary policy stances between the Bank of Japan, European Central Bank and Federal Reserve likely to send the Yen and Euro lower against the Yuan, we forecast only gradual losses for CNY against the US Dollar from current levels. Get in touch to discuss your Chinese Yuan exposure.